Average is nice and we have tracked it for years, obviously. But healthy clubs are the important thing. And we're better off there, regardless of whether an MLS2 team goes away and that helps the math. matbluvenger, JBG - Bribe Taker, Todorojo and 1 other person repped this. Regarding your "it's still to early to tell if the true reason for these teams - player development - is paying off" comment ... SKC has 6 players on the roster that previously had USL/Swope Park contracts. A number of other players have seen time (including season long loans) with Swope Park ... and the two new teenage HGP's will likely see time with SPR next year. What do you think a metric would be for us to answer "it has likely been worth it for team XYZ". Right now it's still very much up in the air (like you said). The 6 players signed are all "end of the roster types" with a couple of them potentially being groomed to be bigger pieces in the next couple of years. I'm sure everyone has an opinion on the matter, and without knowing what it "costs" a MLS team to put a "2" team out there, it's likely we don't know the "metric" needed. A team like SKC who doesn't spend their own money on DP's to the level other teams obviously do, but still get results (consistently a playoff team and have multiple trophies the last 4+ years) does this matter more to us than a TFC or a LA Galaxy? I do not know. It may vary by team. SKC may figure six end of the bench players make it worthwhile. Vancouver seems to feel they are not getting what they want out of it. Other teams may want to develop someone they can sell and base success on that. Another may want to develop a particular position. I do not know if there is a one size fits all magic metric. The oldest of these MLS2 teams just completed its fourth season. If someone wants to analyze all the players who have moved up, they can. Measuring the success of an MLS2 side in terms of player development is such a subjective thing. (i) It develops 1 player who become a 1st team regular who goes on to be sold to a major European club for a multi millions transfer fee, but otherwise delivers little. Nevertheless that 1 transfer fee covers the cost of the 2 club for several years. (ii) It doesn't really develop any new talent, but lower roster players from the MLS squad get regular game time and go on to establish themselves as regulars in the first team. (iii) The team consistently develops players for the lower end of the MLS roster. None of those players ever become regulars, but several make to reliable first team stand ins, playing 8-10 games a year. (iv) The team developes 2-3 players over 5 years who gradually go on to establish themselves as first team regulars. Depending upon your expectations, any of those scenarios could be deemed making the "2" team worthwhile. None of them have been running long enough to really guage the success of the team. You also then have to consider whether success on the field counts for anything. Do New York RB care that their team won USL last year? Will this years Monarch team that has run away with the USL regluar season this year supply any first team regulars over the next year or so? One thing that I will say from looking at youth development in Europe is that it is not a precise art and success often comes in spells before a long barren patch. Success on the park for developement sides often doesn't lead to new first team players i.e. you have 11 excellent development league players, but none of them are quite good enough for the first team (basically Chelsea for the last 10 years) or sometimes the development side doesn't do that well, but 1 player makes it big (John Terry). All good questions re: the success of MLS2 teams ... I would only add that back in 2015 (and to a lesser degree last year), I would argue that for the PNW and Canadian teams, setting up "2" teams was geographically necessary as there were very few USL teams in the Western or Northeastern US to affiliate with. Sac Republic actually had 2 affiliations in its first year (2014) with San Jose and Portland. Louisville are the best team in the league and defending champs, ye attendance is down over 20%. 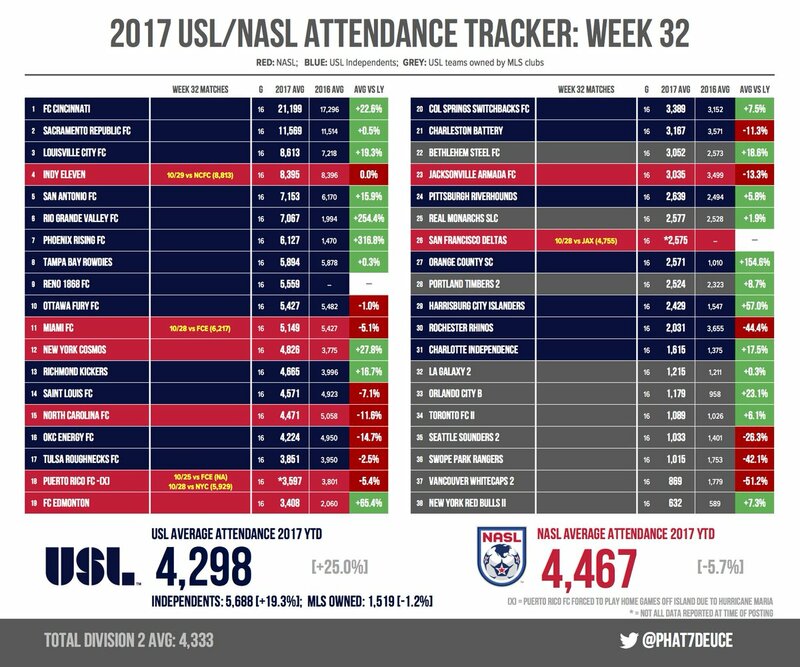 Not sure if this a blip or not, but over all the league has a mixed bag of numbers from 24,505 in Cincinnati to 50(!) in Toronto. 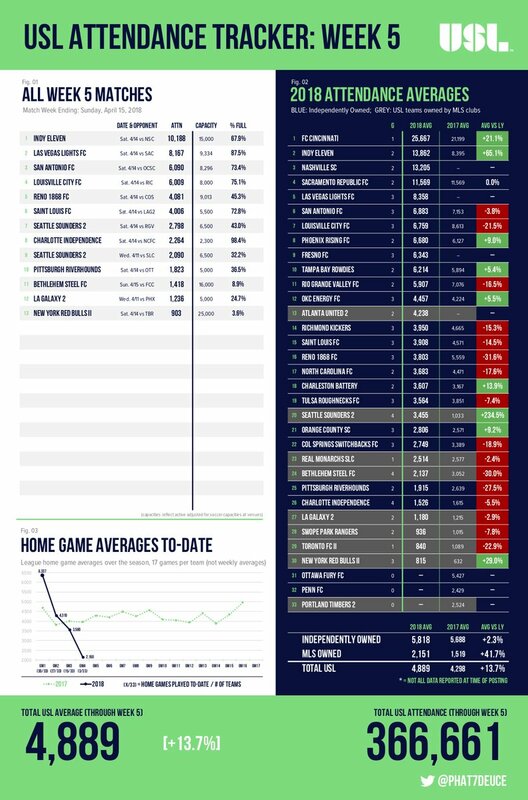 Louisville are the best team in the league and defending champs, ye attendance is down over 20%. Because....wait for it...WINNING DOESN’T SELL ********ING TICKETS BY ITSELF AND NEVER ********ING HAS. 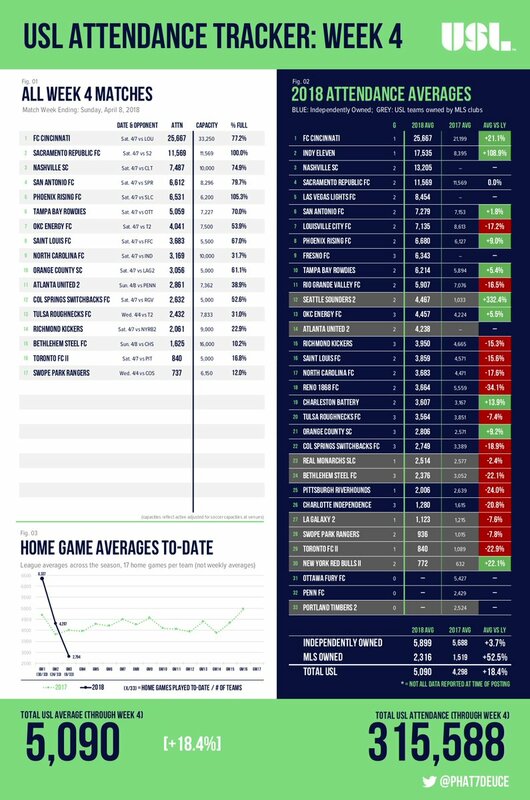 If we're talking USL only then I'd be curious to see marketing and sales efforts in Louisville from 2017 to 2018. They are the best run club in the league right now so cannot imagine they wouldn't capitalize on being champions. 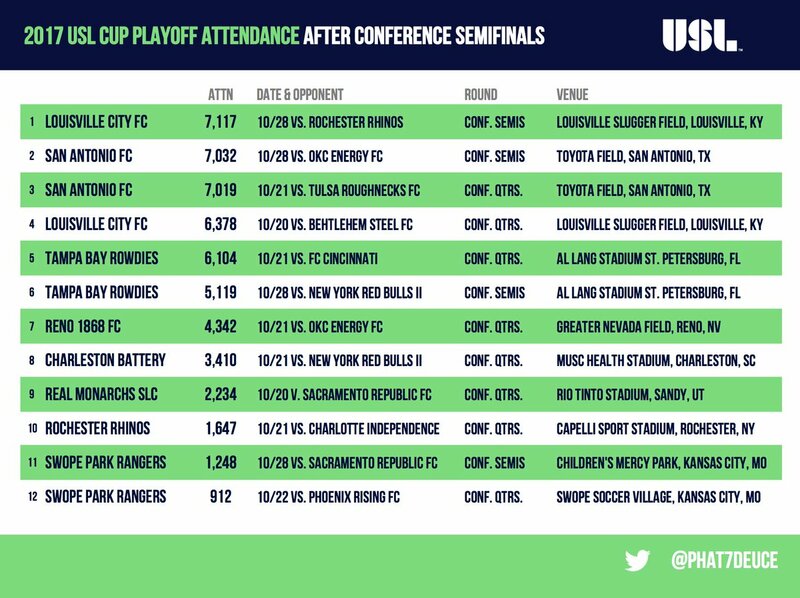 It's not like when New York won it and handful of people cared, Louisville is among best supported sides over past three years. Among major sport leagues such as MLB I have seen winning sell tickets by itself firsthand. The Reds would see ticket sales double by the end of the year if they turned it around and made a playoff run. The odds are the Reds will finish below 18,000 or even 17,000 for the year only five years out averaging 30,000+. Anecdotally I can say dozens of fans I know go far less than when they were winning. To be fair ... trying to judge attendances after 3 games is silly at best. Weather, competing events, and other things can effect casuals much more than season ticket holders. They could have sold more season tix and just not got many casuals to come for the first 3 games but be better off long term. Who knows. though. Which is why I said it could be a blip. We shall see. Point being: you can win, tickets still do not sell themselves (except in the NFL, in most places, where a winning season helps sell season tickets the next year, as most NFL tickets are sold as season tickets.). A winning team is a feature to sell, but if you are not equipped to take advantage of it, you can win all you want. MLB teams have sales and marketing people? Who knew? Unless you’ve sold soccer tickets (or tried to, back before the current Golden Era),no, seriously, you are not telling me winning sells tickets by itself. I believe weather is probably a factor as well. Its been cold and rainy and snowy this winter/early spring. 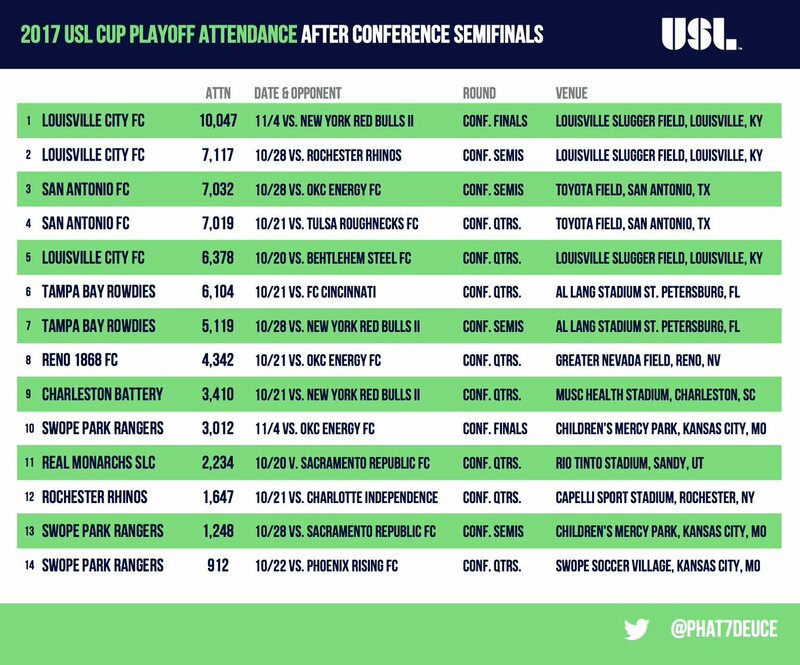 Attendance is down across all outdoor leagues, MLS, USL, MLB, NASCAR etc. Real Monarchs had 4,065 attend their first game at their new home at Zion's Bank Stadium on Monday, against the Las Vegas Lights.